Pictured, Micah Flick Deputy Sheriff of the The El Paso County, Colorado office. 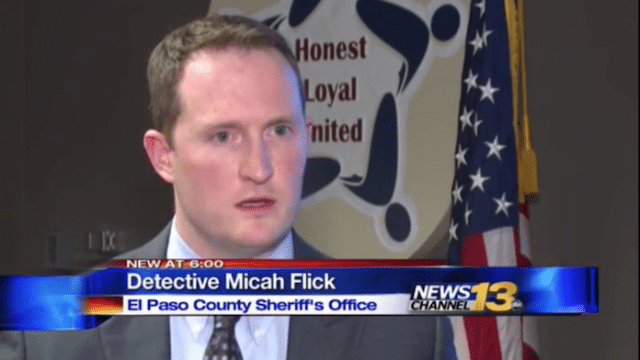 Micah Flick Deputy Sheriff of the The El Paso County, Colorado Office is shot dead in the line of duty, the latest Colorado police casualty as violence continues unabated. Micah Flick a 34 year old Colorado sheriff’s deputy has died after being shot while investigating an incident of a stolen vehicle in an ensuing gunfight in Colorado Springs. The El Paso County Sheriff’s Office in a Facebook statement told of Flick being fatally wounded on Monday along with three other law enforcement officers and a bystander following an altercation with a suspected car thief. The officer’s death comes on what was Officer Micah Flick’s eleventh anniversary of service in the force. The veteran police officer is survived by his wife and two seven year old twin children. CBS News reported Flick and other officers investigating a stolen vehicle when they approached the subject, a male adult, struggled with him, before gunfire ensued. The sole suspect, police said, was also killed. No other suspects were being sought. Colorado Springs shooting: Witnesses heard 8-9 gunshots after a suspect fired at investigating officers. The incident occurred near the intersection of North Murray Boulevard and Galley Road around 4pm. Another witness told the Colorado Springs Gazette he heard 8 to 9 shots. The witness said he heard a few, before there was a break and then heard several more shots and then a final two shots. The injured officers’ names were not immediately released. Officials said two are deputies with the sheriff’s office and the third is an officer with the Colorado Springs Police Department. All the victims were hospitalized. Following the officer’s death, fellow officers payed homage to the fallen policeman, with a procession of dozens of police vehicles reported the Denver Post. In a statement, Colorado governor John Hickenlooper called Flick’s death a ‘senseless act of violence’ and asked Colorado residents to provide sympathy to his family and pray for the injured. Hickenlooper also ordered that flags will be flown at half-mast from February 6 until Flick’s funeral, the date for which has not yet been set. The governor also said the deaths of three law enforcement officers in the state over the past five weeks are having ‘a grave impact’. Since December 31, two other Colorado sheriff’s deputies – Heath Gumm, 31, and Zackari Parrish, 29 – have died after being shot on duty. Colorado Springs is the second largest city in Colorado and is about 70 miles from Denver, the state’s capital and its largest city. This is Deputy Micah Flick. Today, on his 11 year anniversary with the @EPCSheriff‘s office in Colorado, he was shot and killed while responding to a motor vehicle theft investigation.